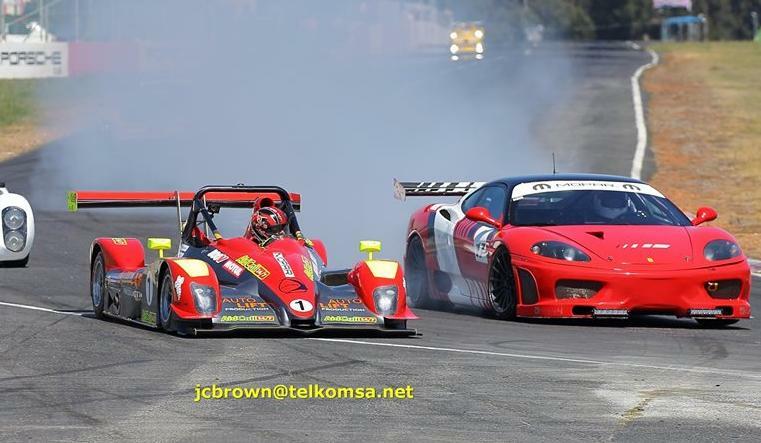 Round 2 of the regional Power Series sponsored by Wingfield Motors at Killarney International Raceway on Saturday 16 March came to a drama-filled climax with the Campos 600 four-hour endurance race for sports cars. Earlier in the day 17-year-old former Formula Ford champion Stuart White had taken the Maui Motorhomes Ginetta G57 to a new outright lap record of 1min06.745sec, finally beating Trevor van Rooyen’s benchmark, set more than three decades previously in a Formula 2 Mazda Maurer. However, the race started without the favourite and pole-position holder, because it was sitting in the pits with electrical problems; the satellite controls on the steering wheel weren’t connecting to the car’s electronics. Less than a lap into the race the yellow lights came on for a virtual safety car period after Eric Salomon’s Lotus 23B collided with another competitor in G-Energy and was left stranded with broken rear suspension. Several competitors opted to dive into the pits, while the rest cruised round at 60km/h for a number of laps while the recovery crew went out and picked up the Lotus. It took the Maui crew more than half an hour to jury-rig a connection and get the Ginetta out on the circuit. By then they were 25 laps down with no realistic chance of the win; the best they could hope for was to get into the top five and bank some valuable SA Endurance Series points. A few minutes later race leader Johan Engelbrecht in the Aquila CR1, came in for a routine fuel stop that turned out to be anything but routine; first he knocked down pit-lane commentator Colin Hastie and then, seconds after fuel began flowing, the car burst into flames. Killarney International Raceway’s marshals were almost too quick to react; before Engelbrecht could even think of getting out of the car several fire extinguishers had covered it (and him) from headlights to tail-lights in white powder, and the Aquila’s race was run. That put the AidCall 24/7 Ligier of Nick Adcock and Michael Jensen in the lead, despite an unplanned early stop to replace a flat tyre, with the Strocan Ligier of Trevor Frost and Johannes Bothma, the Comenius Ligier of Fritz Kleynhans and James Forbes, the Stradale Motorsport Lamborghini Gallardo GT3 of father and son Harry and Charl Arangies and the Bucketlist Ferrari F360 of Kishoor Piamber and Kris Budnick their only realistic challengers. The much publicised Mills Motorsport Ginetta G55 of former Formula 1 driver and Le Mans winner Jan Lammers and Greg Mills spent most of the four hours in the garage, first with disintegrating front bodywork and later an hydraulic leak caused by a kinked power-steering hose. The Backdraught Roadster of Brian Martin and Trevor Graham ran the majority of the race without its bonnet in an effort to keep its Lexus V8 from cooking itself, while the NSA Giulietta of Theo van Vuuren and Keegan Ward, which dominated the Index of Performance in the 2018 SA Endurance series, blew its gearbox shortly before half distance, badly enough to crack the casing and spill gearbox oil on the pit apron – to Hastie’s distaste! – handing the Class B lead to the Autohaus Angel Honda Civic Type R of youngsters Dayne Angel and Jarryd Evans. Then disaster struck again for the Maui crew as the Ginetta sheared a driveshaft after only 29 laps, and its race was run. By the halfway point after two hours the AidCall 24/7 Ligier had completed 82 laps and was four laps clear of the Strocam and Comenius Ligiers, with the Stradale Lambo another lap down in fourth and the Bucketlist F360 7 laps off the pace. However, the Comenius JS53 Evo was actually in the pits at the time, and sadly, never reappeared, while the Strocam JS49 was also in trouble, and dropping steadily down the order. Even the leading AidCall 24/7 Ligier had a problem – a broken bracket on the rear underbody diffuser mounting at dropped the diffuser down onto the track and left a trail of sparks all the way round the circuit in the gathering darkness. A frantic pit stop to try (unsuccessfully) to repair the damage cut the Ligier’s lead down to mere seconds and set up a cliffhanger finish that will go down in the history books. For most of the final hour the Charl Arangies in the black Gallardo was all over the back of the Ligier until, with only about 20 minutes to go, Arangies blasted past to take the lead for the first time. But Jensen in the AidCall 24/7 hung on like grim death, retaking the lead with mere minutes to go. Even then it wasn’t over; on what turned out to be the penultimate lap, Arangies spun in G-Energy Corner and lost a few seconds getting going again, to finish just 4.075sec behind Jensen after 160 laps of action-packed racing. The Bucketlist Ferrari completed 152 laps to finish third, four laps ahead of the Autohaus Angel Civic (winners of Class B and the Index of Performance), followed by the two Backdraught Roadsters and the sole surviving Nash MVW3 (out of four), that of Howard Blake and Andrew Horne.